I guess technically this is a soup but we served it last night in wide bowls over a pile of quinoa and it’s as soupy as some of our stews. Or is it as stewy as some of our soups? Whatever its label it’s really good. Complex flavours. Gorgeous colour. The raisins (I used currants) give you a hit of sweetness. This soup, while heavy and warm, gets “uplifted” by the light, refreshing addition of green onions. It’s from a blog I like, 101 cookbooks. This soup will help brighten any cold night with its colour – “the color I see when I close my eyes and turn my face toward the sun” as Heidi notes – and pungent warming taste. Yum. In the meantime, in a small dry skillet or saucepan over low heat, toast the curry powder until it is quite fragrant. Be careful though, you don’t want to burn the curry powder, just toast it. Set aside. Place the olive oil in a pan over medium heat, add half of the green onions, the remaining ginger, and raisins. 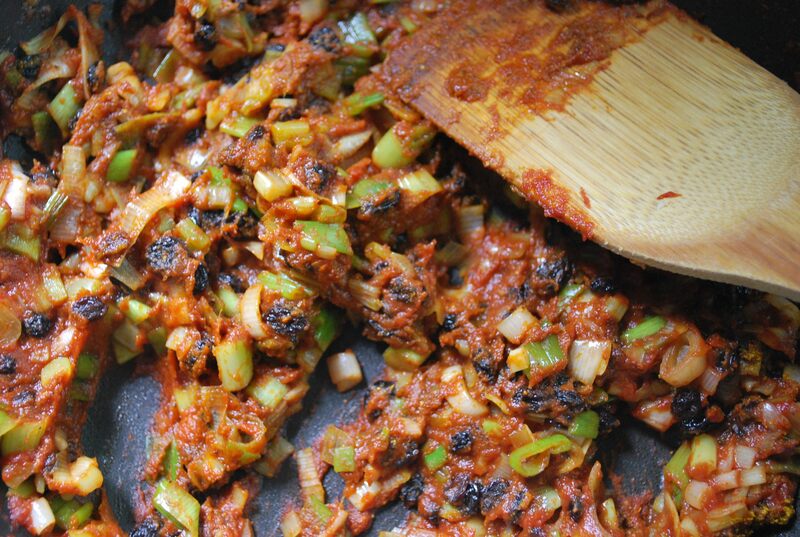 Saute for two minutes stirring constantly, then add the tomato paste and saute for another minute or two more. Add the toasted curry powder to the tomato paste mixture, mix well, and then add this to the simmering soup along with the coconut milk and salt. Simmer, uncovered, for 20 minutes or so. The texture should thicken up, but you can play around with the consistency if you like by adding more water, a bit at a time, if you like. Or simmer longer for a thicker consistency. Sprinkle each bowl generously with cilantro and the remaining green onions. 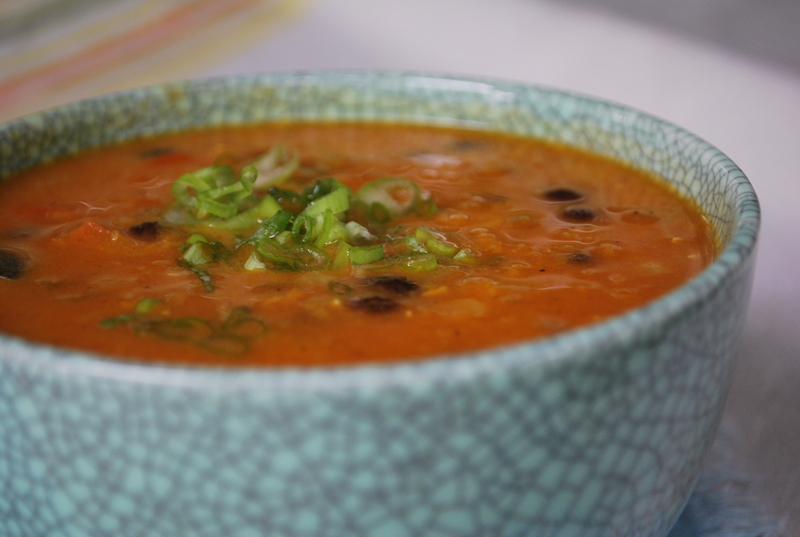 You have to try this lentil soup – so easy and so super good. This site is awesome by the way – I really relied on it when I went Vegan a few years ago. Keep up the good work – this is a nice simple recipe can’t wait to try it. Thanks Neil! Appreciate the kind words and the recipe suggestion. Will check it out soon. Muchos gracias. Thanks Emily – I agree! One of my favourities as it’s sweet and savoury, delicious and nutritious. Glad you like it and thanks for the comment! !